This day trip from Colombo to World Heritage-listed Kandy takes you to many popular attractions in the region. Learn about Ayurvedic medicine at the New Paradise Spice and Herbal Garden in Mawanella, see the Temple of Tooth Relic (Sri Dalada Maligawa), and visit a batik factory and the Gem Museum. Lunch and round-trip transportation from your hotel or cruise port are included. Full day of activities. The best way to see Kandy if you have limited time. Overall we loved the tour because Kandy was beautiful, and enjoyed the over-touristy stops. However, we were extremely disappointed that our driver ripped us off by charging us for a dancing show that was in fact free. The driver asked us to give him the money for the tickets outside the show and reassured us that he would organise it all. While in the show we asked other tourists how much they paid for tickets and all of them said it was free and you only donate to the dancers at your own discretion, sure enough this was the process. We felt that we could not confront the driver about the situation as it might cause us to be abandoned in Kandy which is 3-4 hours away from Colombo. Also the manner in which the driver drove us back to Colombo was erratic, unsafe and we feared for our lives. very poor. The guide was was n't that good. the experience was very shoddy nowhere near what I had expected. Wow, what wonderful things can't I say about our experience on this trip? SRI LANKA IS MAGICAL! Our tour guide was very knowledgeable and courteous throughout our trip. Each and every site we visited was better than the one before. Although, Pinnawala was an amazing experience and made our trip to Sri Lanka whole. The Batik shop was full of wonders that we could not have imagined. Each guide at the sites was very kind and was able to truly make us feel at home. We had a wonderful time on this tour. Guide was excellent.The elephants are so cute. I would deffinatey recommend this tour. fun stuff! i would recommend to anyone the same! Our tour guide Isuru did a great job of showing us Pinnawala Elephant Orphanage and Kandy City. Isuru picked out interesting attractions on the way to both of these places to keep the long car ride more entertaining. Some of these attractions include the properties of the well known family of Sri Lanka whom the Colombo airport is named for, some exotic fruits and foods being sold or grown near the street, and old historical parts of Sri Lanka, such as the old British steam trains. I wish we could have spent more time in Kandy to explore, but as we visited so many interesting places, time was not on our side. 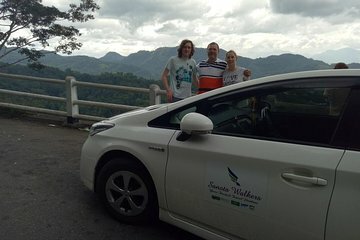 This is a good company to do tours with in Sri Lanka.